This little chap from Little Miss Muffet Stamps, is Bandit Boy Tom and he reminds me a little of Sweet Cheeks. The past few months or so, I've become aware of how much The Cheeks has changed from a toddler, to a little boy. We've spent a lot of time together this summer, more so than last year, just 'doing stuff'. Mainly outdoors, because that's where he likes to be. There's an area in the garden where the grass doesn't really grow and because of all the rain we've had this summer, it's often pretty muddy, and if it's not, it only takes a bucket of water to get it back. We call it The Swamp, and Sweet Cheeks (or rather, Super Sweet Cheeks as I'm required to call him when he wears his pants over his shorts!) will happily play in it, and the sand pit, with his cars, for hours. Sometimes he wants me to play with him, sometimes he just wants me to be in the garden too. Either way, we've been out there alot. Awww such a lovely card Faye. The image is gorgeous and you have coloured him so beautifully. It sounds like you have had a wonderful summer with Sweet Cheeks. I'm the same as Cheryl, I love to have my children at home in the holidays and hate it when they go back to school. Hi Faye, another gorgeous card - great papers and you keep tempting me with those stars! Know exactly what you are feeling and going through - I was there this time last year. Emily was starting Year Reception and I felt like I was loosing my baby. Have to say though, that yes I do still miss all the groups we went to and the things we did during the day (swimming, park, playing in the garden) but it's been replaced with a lot of different things to treasure - school plays, DT week assembly, YR assembly, merit presentations. And so much stuff brought home that she made - we've got a trunk full of the stuff!! She's made some new friends, some older friends, she has improved beyond belief with writing, spelling, maths - and she loved her teacher and teaching assistant. Now I'm dreading Year 1 - she's not!!!! PS - I'm on the fence with whether I'm pleased she's going back to school - she's been an angel one week and a little 'orror the next. But it's still been lovely to re-live the 'not at school' feeling. PPS - The Boettes are doing fine, they climb curtains, chew ribbons and chipboard and pee on my papers!!!!!!! Such a fab card Faye and tressure those moments,mine sweet cheek is going to be 20 next September,where did the time goes!!! 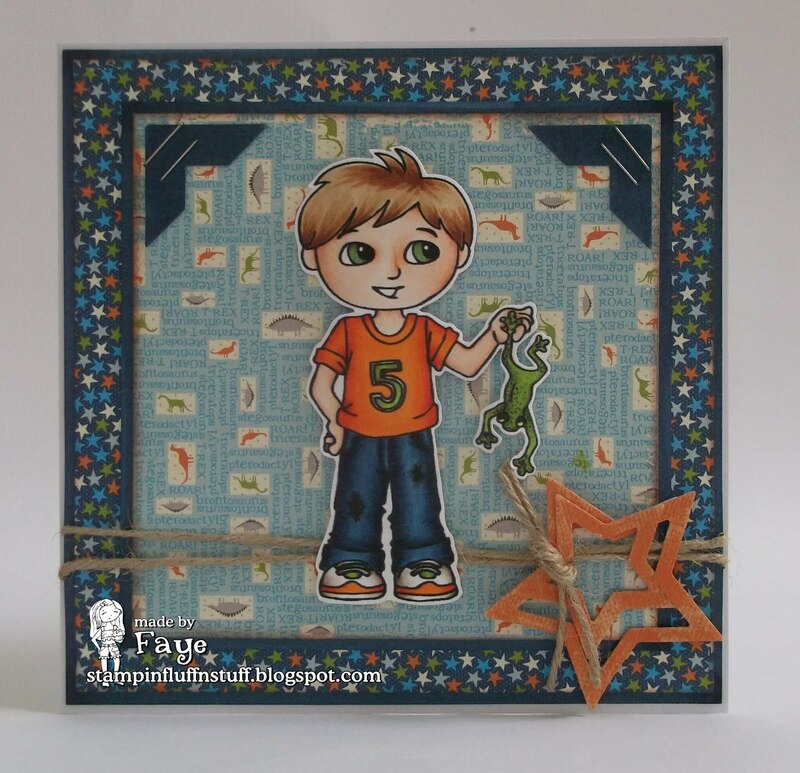 Fab boy card Faye! I love the staples and the stars! Aww... your wee man is growing up! Wonderful card Faye, the image is gorgeous I like the papers and the twine. I've shed a tear for the passing of each stage too but as they move on they bring new joys. You should frame this and let it remind you always. A gorgeous Super Sweet Cheeks card, Faye....great colouring and lovely details! CUTE image for a little guy and I love all the DP you used on this Faye! Outstanding! Aww, too cute! Glad to hear that Sweet Cheeks is enjoying the great outdoors so much! Hang in there girl, he will love pre-school and you will get used to it too! Aww, I know just what you mean Faye; one minute they're chubby little toddlers and then all of a sudden they're 'real' boys and girls. I felt like this with my three when they were little and now with my granddaughters too. A gorgeous card with such a cute image - perfect! So that explains the photo!!!. I'm gonna start in a mo too. Hugs Muver. Broom, broom, beep, beep - I'm being a bus today (nothing for ages then two at once - look I made a funny!). Just had to swing by and say I caved and now have the stars dies winging their way to me - my excuse is I've b'day money burning a hole in my pocket. Not that I'm weak willed and want every bit of craft stuff out there!! They do grow up awfully fast! Beautiful coloration and love the combination of blues and oranges together. Keep the card! You have to! It's super cute and an evocative memento of your fab summer together. Presumably the (beautifully coloured!!!) Sweet Cheeks on the card didn't have time to don his underpants over his trousers before saving this little frog from the Swamp. He is saving him isn't he? How fun to have your own personal swamp! And how awesome that he is able to amuse himself with something like that, he must have a great imagination to be that creative. Hugs! This is a super fantastic card Faye. The image is great. 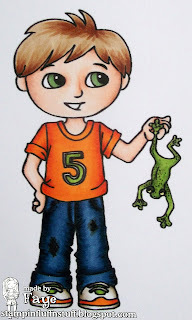 I wish that little boy would come to my garden and pick up my frogs that have appeared recently. I am petrified of them!!! I'm glad to hear that he enjoys the great outdoors. Oh, and I remember the lump I had when they started school and now they're 15 and 17 and don't need me at school starts.